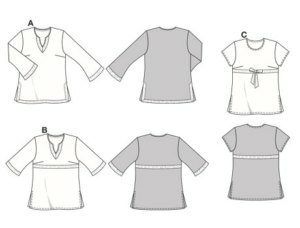 Chic tunic in three fashionable versions, all with side slits. View A has long trumpet sleeves and decorative trim on the neckline as well as on the hem and slit edges. View B has flared ¾-sleeves with trim on the sleeves and front. View C has short sleeves, round neckline and tie-bands with bow.